Chances are you’ve heard about the I-woke-up-like-this phenomenon inspired by Beyoncé’s song “Flawless.” While waking up with a picture-perfect face seems far-fetched, even for Bey, the idea of dressing to look strategically messy yet put-together isn’t. From oversized outerwear to worn-in basics and messy bedhead, the laid-back, cool-girl vibe is in right now. In other words, the less you try the better. To help you achieve this undone look, we’ve put together the ultimate styling guide. 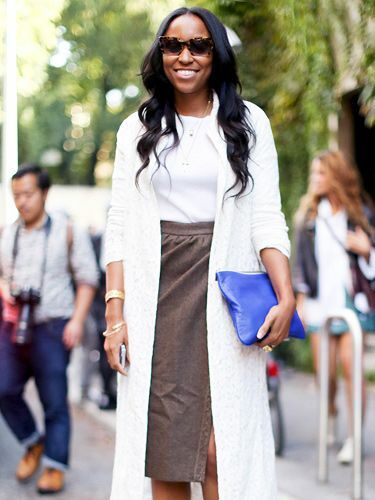 Click through to learn 13 simple ways to look effortless. Sometimes your jacket simply looks better draped over your shoulders. Distressed denim always gives off that too-cool-for-school vibe, especially when it’s styled with oversized outerwear. Wear more convenient cross-body bags. Dare to unbutton one more button, which better displays your dainty, barely-there necklaces. Master the art of the half-tucked shirt. Scrunch your sleeves and slightly tousle your hair. Don’t stress if your shirt’s got a few wrinkles. They add character—and you’ll never look like you’re trying too hard. Just remember you can never have enough simple yet well-made t-shirts. Invest in a moto jacket that can be dressed up or down. Expose just the right amount of skin. Slip into something vintage for a perfectly worn-in vibe. Embrace layering and draping, especially during the cooler months. When in doubt, opt for an oversize silhouette. Are you a fan of the undone look? Let us know in the comments below!